On 8 June 2018 the Appeals Chamber of the International Criminal Court acquited the Congolese businessman Jean-Pierre Bemba from the charges of war crimes and crimes against humanity committed by the troops of his Mouvement de libération congolais (MLC) in the Central African Republic between October 2002 and March 2003. The then President of the Central African Republic, Ange-Félix Patassé, had called Jean-Pierre Bemba and his MLC for help, to subdue the rebellion of François Bozizé. The Court has still to decide on charges of witness tampering. The Mouvement de libération congolais (MLC) originated in the Second Congolese War (August 1998 – July 2003). This conflict was marked by human rights violations on a catastrophic scale perpetrated by all the parties involved. In July 1998 Laurent-Désiré Kabila had decided to expel his Rwandan and Ugandan allies from the Democratic Republic of Congo. Meanwhile he had antagonized many Western governments and investors. Quickly thereafter, in early August, violence erupted in the eastern provinces of Congo. The Tutsi rebel group Rassemblement congolais pour la démocratie (RCD), backed by Rwanda and Uganda, occupied large chunks of eastern Congo. The Congolese army was no match, and throughout August 1998 Rwandan, Ugandan and rebel forces steadily encircled Kinshasa taking control of Kitona, Muanda (in the west), and Kisangani. Kinshasa began to arm Hutu militias (FDLR) in the east of the country to put a halt to the advance. Angola, Namibia and Zimbabwe acknowledged Kabila’s cries for help and were dragged into the conflict. In November 1998 the Mouvement de libération congolais (MLC) was set up in Equateur province with aid from the Central African Republic and Uganda. In early 1999 an internal power struggle within RCD caused the RCD to split in two factions: RCD-Goma and RCD-Kisangani. The latter quickly sided with Uganda. Tensions between Rwanda and Uganda reached a boiling-point in August 1999. 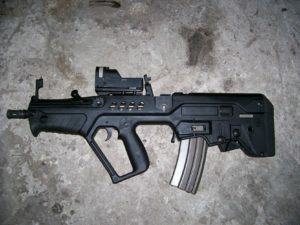 When Bemba left Kinshasa, security personnel of the South African embassy found two assault rifles left behind by Bemba’s Division de Protection Présidentielle (DPP). 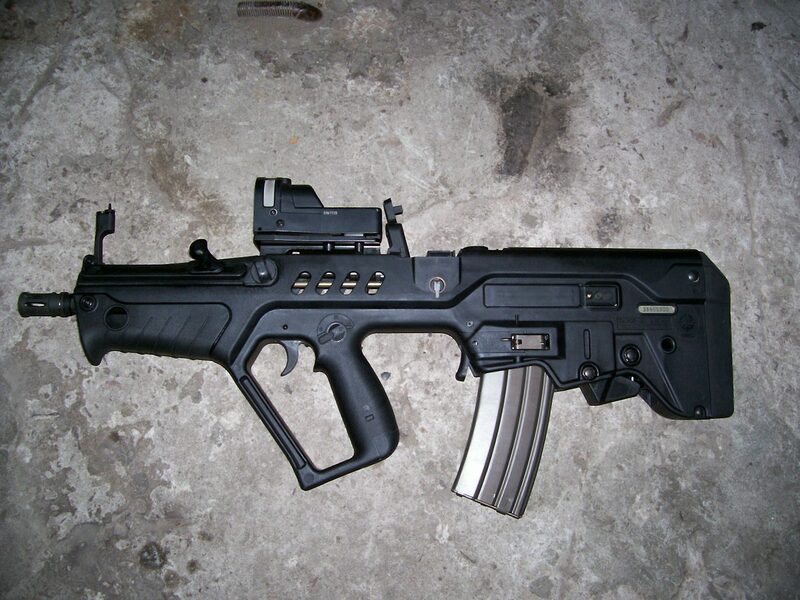 The assault rifles were Israeli made 5.56mm Tavor rifles. The following years, rebel groups and local defence groups split into numerous factions, all backed by either Uganda, Rwanda or Kinshasa, and switching sides ever so often. Ethnic conflicts were incited by Rwanda and Uganda to loot, plunder and exploit the DRC’s natural resources. For instance, in the Ituri region Uganda exploited existing tensions between the Hema and Lendu. Both the Hema and Lendu militias were armed and trained by the Ugandan army to incite ethnic conflict. Thus the International Court of Justice judged against Uganda in the “Case Concerning Armed Activities on the Territory of the Congo” on 19 December 2005. (DR Congo vs. Uganda)”. Meanwhile Rwanda continued to support Tutsi rebel groups in the Kivus. In 2003 RCD-Goma and MLC joined Joseph Kabila’s PPRD into a transitional government. Bemba was forced to go into exile in April 2007. 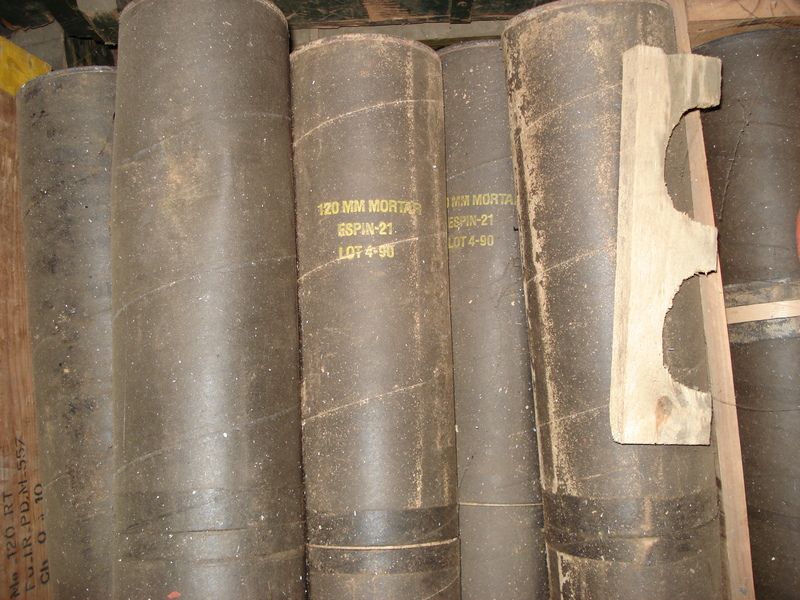 In Gbadolite (in the former Equateur Province), in an abandoned Coca-Cola factory, the FARDC found a complete arsenal which used to belong to Bemba’s Division de Protection Présidentielle DPP. Gbadolite had been captured by MLC somewhere late 1998, and hereafter became the MLC’s headquarter. 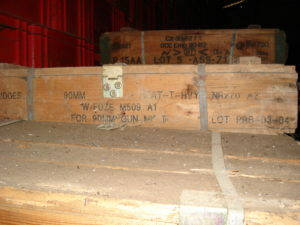 We cannot say where or when the MLC acquird the weapons and ammunition. 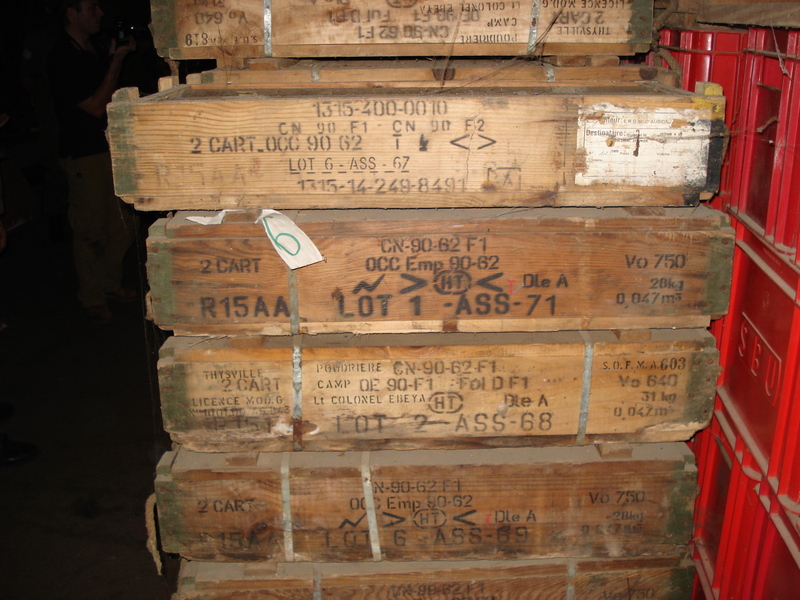 Most likely, some of them originated from the stockpiles of the armed forces of Zaire. Others were most likely supplied by their Ugandan overlords. We do know where the ammunition and weapons were manufactured: Belgium, France, USA, China, Spain, Soviet Union, Iran, former Yugoslavia, Israel… Most of these were relics from the Cold War with manufacturing dates between 1953 and 1996. Government representatives are meeting at United Nations Headquarters to review global action to address the illegal flow of revolvers, pistols, assault rifles, machine guns and other similar weapons. Algeria’s National People’s Army (ANP) has taken into service what appears to be Norinco’s vehicle-mounted rapid deployment system for the W86 120 mm mortar, it was revealed when Chief of Staff Lieutenant General Ahmed Gaïd Salah visited the Central Logistics Base in Blida on 30 April. Les Etats-Unis ont officiellement remis, ce mercredi 2 mars, à la Base Aérienne Adji Kossei, deux avions de reconnaissance de marque CESSNA ISR, des équipements, des matériels de servitude et des hangars à l’armée de l’air tchadienne, lors d’une cérémonie en présence de l’ambassadrice des Etats-Unis au Tchad, Geta Pasi et des autorités militaires tchadiennes. The Nigerian Air Force (NAF) announced on 30 April that it had received two new Mil Mi-35M attack helicopters. The Israeli ministry of defence has prepared a new plan to increase the export of military hardware to Africa starting this year. The Algerian military has taken delivery of more than 400 utility vehicles that were manufactured locally. Israeli defence company Elbit Systems is negotiating more contracts with African countries. This comes after last year it signed a $240 million contract with an African country. Most of the negotiations focus on the upgrade of fixed wing aircraft and helicopters. The Paramount Group has, as part of its Middle Eastern sales drive, offered its expertise to grow Egypt’s domestic defence industry. Algeria has confirmed the acquisition of TOS-1A multiple rocket launchers from Russia after one system was seen during television footage of an exercise on 12 May. The Sudanese Air Force has taken delivery of its new Chinese-made FTC-2000 jets, the Sudanese Ministry of Defence (MoD) announced on 16 May. 2018 marks the golden anniversary of the South African defence and security acquisition agency – Armscor. It was created as the Armaments Corporation of South Africa SOC in terms of the Armaments Production and Development Act (Act 57 of 1968) to satisfy the requirements of the then SA Defence Force (SADF) as regards defence equipment and materiel. Lawmakers in Rwanda have passed a new legislation on gun acquisition. The new law will allow individuals to apply for licenses to possess guns and for traders to also sell same. En marge de son colloque régional à Kinshasa sur le 40ème anniversaire des protocoles additionnels de convention de Genève, le Comité International de la Croix Rouge (CICR) a fait l’état des lieux de la ratification et la mise en œuvre des traités internationaux et régionaux de Droit International Humanitaire (DIH) en République Démocratique du Congo. Mozambique is currently in talks with Russia to discuss weapons it would like to get under the military and technical cooperation agreement, Mozambican Minister of Foreign Affairs Jose Pacheco told TASS on the threshold of the talks in Moscow. A bill to regulate small arms and light weapons in Nigeria yesterday passed second reading in the House of Representatives. Co-sponsor of the bill, Nnenna Ukeje (PDP, Abia) said the bill became necessary as Nigeria presently accounts for 70 per cent of over 500 million small arms and light weapons in circulation in West Africa. Après la chute de Mouammar Kadhafi, ses réserves d’armes sont devenues des stocks en libre accès. Plongée dans une crise, la Libye est peu à peu devenue le paradis des trafiquants d’armes. Aujourd’hui l’export aussi bien que l’import ont créés une économie des armes. Selon des informations rapportées par la presse nigériane, une importante quantité de cartouches a été saisie jeudi 31 mai par la police nigériane à frontière d’Ilaru entre le Nigéria et le Bénin. Rwanda is interested in acquiring Russian air defence systems, Russian Foreign Minister Sergey Lavrov said during a visit to Kigali on 3 June. Cattle rustling is by no means a new problem in Africa. Pastoral communities in East Africa and the Horn of Africa have dealt with it for generations. Cattle rustling or raiding was integrated into cultural norms and accepted as a way to balance community wealth and power. Driven by community need, it was redistributive and reciprocal. Today, 8 June 2018, the Appeals Chamber of the International Criminal Court (“ICC” or “Court”) decided, by majority, to acquit Jean-Pierre Bemba Gombo from the charges of war crimes and crimes against humanity. Judge Christine Van den Wyngaert, Presiding Judge in this appeal, read a summary of the Judgment during a public hearing. Mr Bemba will remain in detention on account of another case in which he has been convicted of offences against the administration of justice, pending a decision of Trial Chamber VII in that case. The State Department has made a determination approving a possible Foreign Military Sale to Germany of three (3) C-130J-30 aircraft and three (3) KC-130J aircraft for an estimated cost of $1.40 billion. The Defense Security Cooperation Agency delivered the required certification notifying Congress of this possible sale today. Le gouvernement canadien s’étant montré incapable de déterminer si des violations de droits de la personne ont été commises contre la minorité chiite en Arabie saoudite par le régime au pouvoir, les permis d’exportation des véhicules blindés canadien qui avaient été suspendus il y a 11 mois viennent d’être réinstaurés. Now that production of the M777A2 155mm/39 calibre lightweight towed howitzer is underway again, BAE Systems is looking for additional export opportunities in the Middle East. The M777 was originally developed to meet the requirements of the US Army and Marine Corps to replace their much heavier M198 155mm/39 calibre towed howitzers. L’US Air Force réfléchit actuellement à ajouter une déclinaison du Pilatus PC-9 à sa flotte de combat. Modifié pour l’attaque au sol, l’appareil pourrait être utilisé dans des pays comme l’Afghanistan. The State Department has made a determination approving a possible Foreign Military Sale to Bahrain of General Purpose (GP) and Penetrator Warhead bomb bodies for an estimated cost of $45 million. The Defense Security Cooperation Agency delivered the required certification notifying Congress of this possible sale on May 17, 2018. Dos de las cuatro lanchas artilladas tipo Shaldag que Argentina compró a Israel llegaron en los últimos días al país austral, donde se destinarán al control del narcotráfico en el mar. Las unidades las adquirió el Ministerio de Seguridad al Ministerio de Defensa de Israel (SIBAT), por casi 49,5 millones de dólares, en el marco de un plan de reequipamiento para la Prefectura Naval. We know why the Liberals won’t fix this bill: for them, the economic benefits of selling weapons to countries like Saudi Arabia outweigh human rights. The Trump administration is forging ahead with a previously sidelined plan to allow U.S. gun manufacturers sell their products abroad more cheaply and easily. The Crown corporation that helped broker the controversial sales of Canadian military equipment to Saudi Arabia and to the “Madman of the Philippines” gets a cut of the proceeds, prompting critics to warn it has little incentive to scale back its involvement in lucrative arms deals despite a government order to do so. The Nicaraguan army has taken delivery of 12 trucks on May 24, 2018. The trucks were delivered through Guasaule via Honduras. While few details were released by the Ministry of Defense, a statement on its website indicates that the trucks were ordered months ago to initiate the replacement of Nicaragua’s current inventory of ageing vehicles. The United States has approved the potential sale to Bahrain of 12 Bell AH-1Z Viper attack helicopters. The State Department approval, which was announced by the Defense Security Cooperation Agency (DSCA) on 27 April, covers the helicopters and their associated sustainment and support equipment, as well as weapons and other ancillary items. he Afghan Air Force (AAF) has received a further two Sierra Nevada Corporation (SNC)–Embraer A-29 Super Tucano light-attack turboprops to add to the 20 already delivered. The Israeli ministry of defence has prepared a new plan to increase the export of military hardware to Africa starting this year. “Some countries in Africa have indicated that they are willing to evaluate our products” a senior source in the Israeli defence establishment said. Paramount Group is in talks with countries in the Middle East, including Saudi Arabia, over establishing industrial partnerships whereby the defence company would transfer technology and establish local production lines. Hanwha Defense Systems of South Korea has teamed with the Malaysian firm AVP Engineering to offer the 6×6 Tigon armoured personnel carrier (APC) for a potential Malaysian Army requirement. The King Abdullah II Design and Development Bureau (KADDB) (Hall 5) is showing its latest Al-Mared (8×8) armoured fighting vehicle (AFV) in the armoured personnel carrier (APC) configuration. For a high level of cross-country mobility, the Al- Mared is based on a Tatra chassis, to which is fitted an all-welded steel body, claimed to provide ballistic protection up to STANAG 4569 Level 4, but with growth potential to Level 5. China’s Aerospace Long- March International (ALIT) is showcasing its WS-43 loitering munition. The weapon is part of the Weishi family of multiple-launch rocket systems, and is described as a “miniature cruise missile attack system”. A full-scale mock-up is on show as part of the ALIT display. By the end of May, the Indian army will receive a first batch of 25 K9 Vajra-T 155mm/ 52 calibre self-propelled howitzers developed and manufactured by Larsen and Toubro (L&T) Defence. The government awarded a 100-unit contract to L&T in May 2017. L&T, along with its South Korean technology partner Hanwha Tech Win (HTW), had bid for this ‘Boy Global’ acquisition programme of the MoD in 2011. Jordanian firm Jadara Equipment and Defence Systems has completed development and commenced production of the new Terminator anti-tank guided weapon (ATGW) system. Orbital ATK is highlighting a range of its products at SOFEX. Among them is the latest version of its AC-208B Armed Caravan, which was debuted last year. Known as the AC-208 Eliminator, the new aircraft follows on from the earlier Combat Caravan, which was supplied via US Air Force channels to Iraq and Lebanon. Jordan’s King Abdullah II Design and Development Bureau (KADDB) has developed and tested a new variant of its 4×4 Al-Wahsh vehicle configured for the command and control (C2) and riot control role. India`s military is planning to acquire 25 Nag BMP-2-based self-propelled anti-tank guided missile (SPATGM) systems under a US$70 million contract, according to the Economic Times newspaper. Turkey’s Aselsan has signed a collaboration agreement with Jordanian firm JoSecure, the company announced on 12 May. The Indian Army (IA) has finalised an INR150 billion (USD2 billion) plan to indigenously source assorted ammunition over the next 10 years through public- and private-sector manufacturers. India’s Ministry of Defence (MoD) has issued a request for proposal (RFP) to the joint venture (JV) formed between Russian Helicopters and India’s Hindustan Aeronautics Limited (HAL) for the supply of 200 Kamov Ka-226T ‘Hoodlum’ light multirole helicopters for the Indian Air Force (IAF) and the Army Aviation Corps (AAC). The China-developed Z-19E armed helicopter made its maiden flight Thursday in Harbin in northeast China’s Heilongjiang Province. The new generation export-oriented model was developed by the AVIC Harbin Aircraft Industry to meet the requirements of the international military trade market, according to the state-owned Aviation Industry Corporation of China (AVIC). Azerbaijan’s Defense Industry (DI) Minister Yaver Jamalov said, on April 27, that 89 percent of domestic DI output during the first quarter of 2018 was made up of special-purpose defense products, some of which are exported to more than ten countries. He added that this export volume has doubled compared to 2017. Only around 30 countries took part in the Israeli Foreign Ministry’s gala celebrating the new U.S. embassy in Jerusalem last week. Not coincidentally, Israel’s ties with most of them are based on arms sales used to carry out gross human rights violations. Paramount Group and its Kazakhstan joint venture, Kazakhstan Paramount Engineering (KPE), are exhibiting their latest range of armoured vehicles at the international Kazakhstan Defence Expo (KADEX-2018) in Astana. Ukraine’s state-run defence production concern Ukroboronprom will soon deliver the advanced Oplot-T battle tanks to Thailand. After missing several deadlines over the past few years, the contract for supplying Oplot-T tanks to the Kingdom of Thailand has been successfully completed, Ukroboronprom Director General Pavlo Bukin has said. China National Aero-Technology Import & Export Corporation (CATIC) is displaying a model of the Shaanxi Y-9E. The four-engine transport is in service with the People’s Liberation Army Air Force (PLAAF), and is now being promoted to potential customers in the Central Asian region. Turkey’s Machines and Chemical Industries Board (MKEK) and Turkish Scientific and Technological Research Board (TÜBİTAK) Defence Industries Research and Development Institute (SAGE) signed an agreement on 22 May on research and development (R&D) projects to increase local ammunition production. Kazakhstan has placed a “new and substantial order” for Arlan mine-resistant, ambush protected (MRAP) vehicles, manufacturer Kazakhstan Paramount Engineering (KPE) announced during the 23-26 May Kazakhstan Defence Expo 2018 (KADEX 2018) exhibition in Astana. China North Industries Company (NORINCO) is looking at potential buyers in Central Asia for its latest VT4 main battle tank, built to suit the future information-centric warfare. “There is a huge market for these types of tanks in the region, and we would like to explore the opportunities,” an official at NORINCO tells Daily News on the sidelines of KADEX 2018. China North Industries Company (NORINCO) is showcasing its SR5 Universal Artillery Rocket Launcher (UARL) along with the Fire Dragon 40 rocket at the ongoing KADEX 2018. The four-day 5th Kazakhstan Defense Exhibition kicked off Wednesday in Astana, capital of Kazakhstan. Headed by Publicity Center of China’s State Administration of Science, Technology and Industry for National Defense, seven large military trade companies of China take part in the exhibition with exhibits of weapons and equipment for the army, navy and air force. Pakistan has formally signed for 30 TAI T129 attack helicopters from Turkey, it was disclosed on 24 May. The confirmation of the anticipated sale to Pakistan was made in the political manifesto that Turkey’s ruling Justice and Development Party (AK Parti) has released ahead of the general election scheduled for June. The manifesto states that “a very short while ago a contract for the sale of 30 attack helicopters was signed with Pakistan”. No further details were disclosed and Turkish Aerospace Industries (TAI) had not responded to a request for comment at the time of writing. The defence production sector of Pakistan has signed a deal to export locally manufactured light armoured vehicles called ‘Interceptor’ to Bahrain. Pakistan and Turkey have agreed on the sale of a batch of 30 Turkish-made T129 ATAK multirole combat helicopters. The Indian Express has reported that Ukraine is investigating alleged kickbacks in India’s purchase of spares for military transport aircraft An-32. Ukraine’s Anti-Corruption Bureau suspects the involvement of Indian Defence Ministry officials. Ukraine has received Javelin anti-tank missiles from the United States, Radio Free Europe/Radio Liberty (RFE/RL) reported on 30 April, citing Ukrainian President Petro Poroshenko on Facebook and a US State Department official. Boost for campaigners trying to prevent use of British weapons by Saudi forces in Yemen as judges cite concern over international law. The US government has approved the sale of six Lockheed Martin C-130J Hercules aircraft for an estimated USD1.4 billion to Germany. The Defense Security Cooperation Agency (DSCA) announced on 4 May that the State Department has given the go-ahead for the potential sale of three C-130J-30 transport and three KC-130J aerial refuelling aircraft to the Luftwaffe, along with defensive aids and other equipment. Une poignée de militants du collectif “Agir pour la paix” ont projeté mardi matin de la peinture rouge sur la vitrine du MR à Bruxelles et apposé des autocollants dénonçant la guerre au Yémen. Ils dénonçaient de la sorte les licences d’exportation d’armes vers l’Arabie saoudite octroyées par la Région wallonne. Excalibur Army, a subsidiary of the Czechoslovak Group, has developed the Tatra T815 Patriot – also known as the Medium Armoured Tactical Multi-Mission Vehicle (MATMMV) – with the first example currently undergoing company trials. Yugoimport of Serbia has brought models of its latest self-propelled (SP) artillery systems. The latest Aleksandar 155mm/52 calibre SP artillery system is based on a KAMAX 8×8 truck platform, mounted on the rear of which is the weapon, with a magazine with 12 rounds of ready-use ammunition and another 12 rounds in reserve. MBDA is ramping up production of its Missile Moyenne Portée (MMP) anti-tank guided missile (ATGM) system for the French Army, with the first production systems delivered late in 2017. In French Army service, the MBDA MMP will replace the older MILAN ATGM and the US Raytheon/Lockheed Martin Javelin. The first French Army MMP contract covers the supply of 400 firing posts, 2,850 missiles and a simulator developed by GDI Simulation. Bulgarian company Apolo Engineering is presenting its 60mm Commando smoothbore mortar, which can be rapidly disassembled into four components: bipod, circular baseplate, smoothbore barrel and the sighting system. German prosecutors brought charges on Tuesday against employees of weapons manufacturer Heckler & Koch, whom they accuse of illegally trafficking arms to Mexican federal states to which Berlin has prohibited gun exports. A prototype of France’s Jaguar 6×6 armoured fighting vehicle (AFV) was unveiled at the Nexter facilities in Satory on 16 May in the run-up to the 11-15 June Eurosatory 2018 defence exhibition. Belarusian company BSVT-VV has completed development of its MM-60 multipurpose rocket launcher and has already attracted interest from a number of Asia Pacific countries, a company representative told Jane’s. Manager von Heckler & Koch stehen bereits wegen des Vorwurfs illegaler Kriegswaffenexporte vor Gericht. Nach Recherchen des ARD-Politikmagazins Report Mainz soll auch Geld an Parteien geflossen sein. The Slovak government on 23 May approved a Ministry of Defence (MoD) request for a EUR175 million (USD206 million) procurement of 25 ShKH Zuzana 2 155 mm self-propelled howitzers (SPHs) for the Slovak armed forces. Armenia’s armed forces will receive Russian-made Tor-M2 (NATO reporting name: SA-15 Gauntlet) air defense missile systems in the coming months, Armenia’s Zinuj TV program reported with reference to sources in the Armenian Defense Ministry. Saab has received an order from the Swedish Defence Materiel Administration (FMV) for deliveries of the Carl-Gustaf® M4, the latest version of the Carl-Gustaf weapon system, to the Swedish Armed Forces. With this order, five countries have ordered the new system since it was launched in late 2014. Delivery will take place during 2018. British defence contractors are selling record amounts of arms to Israel, new figures reveal, just days after it was confirmed that Prince William will represent the UK government on a visit to the country next month. Quel qu’en soit le lieu, la guerre apporte de façon quasi systématique des violations graves du droit international des droits de l’Homme et du droit international humanitaire. The UK failed to tell Bosnia of its suspicions about a consignment of bullets bound for Saudi Arabia, which has a habit of diverting arms to proxies in Syria and Yemen. A former UK defence secretary accused of directing the illegal lobbying of another former minister in a foreign country. Another British citizen in another country defending allegations that he acted as a conduit for bribes to win a contract the company should never have won. And apparently no formal UK investigation. Such is the way in the controversial world of UK arms exports. An arms sales watchdog has accused the UK government of a serious failure to disclose intelligence that could save the lives of thousands of people involved in ongoing global conflicts. The Balkan Investigative Reporting Network (Birn) highlighted the dangers of the “diversion” of arms and ammunition legally supplied to Saudi Arabia but then passed on to third-party “proxy fighters” including terror groups, and said the practice was fuelling conflicts.